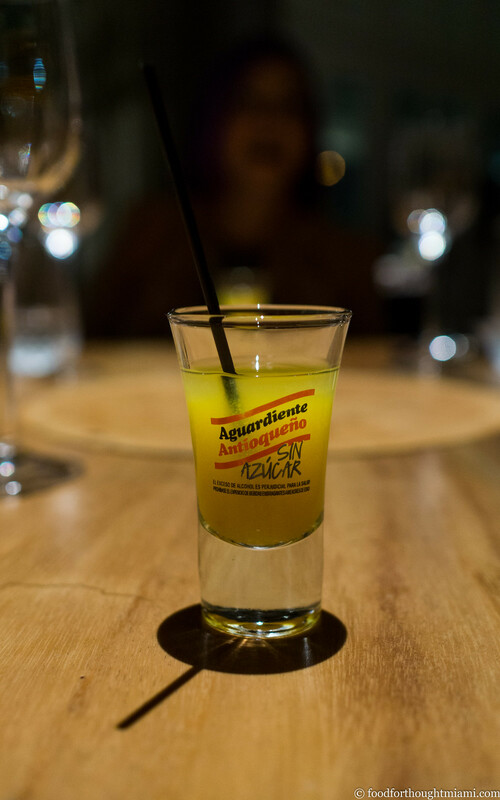 There are few places in the United States where you can have as varied a sampling of Latin American flavors as in Miami. And yet there are only a handful of such restaurants here that strive to operate on the higher end of the dining spectrum. Decades ago Douglas Rodriguez did it with Yuca and then Ola, and more recently, Gaston Acurio's branch of La Mar in Brickell raises the bar for Peruvian food. But these types of places are still the exceptions. Add El Cielo to the mix. Its chef is Juan Manuel Barrientos, a 31-year old who looks like he could be half that age, but whose flagship in Bogotá, Colombia has already been recognized in the S. Pellegrino "Latin America's 50 Best Restaurants" list. 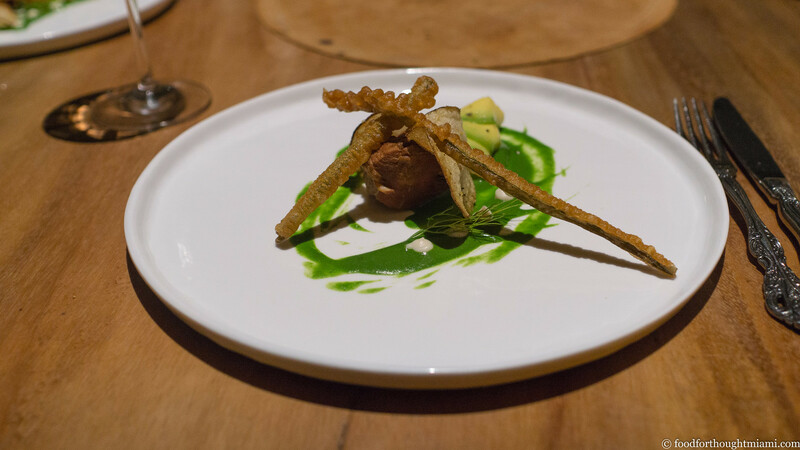 His ambitious tasting menus mix traditional Colombian ingredients with modernist methods and dramatic presentations. 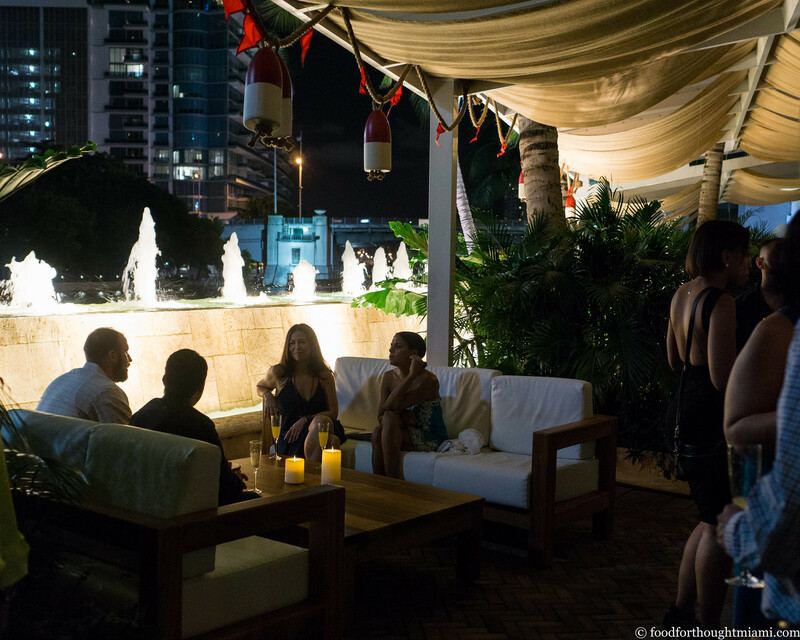 Earlier this year, he opened another iteration here in Miami, which a couple weeks ago played host to our 57th "Cobaya" dinner. (You can see all my pictures in this Cobaya del Cielo flickr set). After a bit of a head fake to start (we had our guinea pigs meet at a small café around the corner from the restaurant's location inside the Brickell on the River condo, where they were given a little snack for the walk over), we had cocktails out on the patio before being led inside to the dining room. Things get kind of weird quickly. 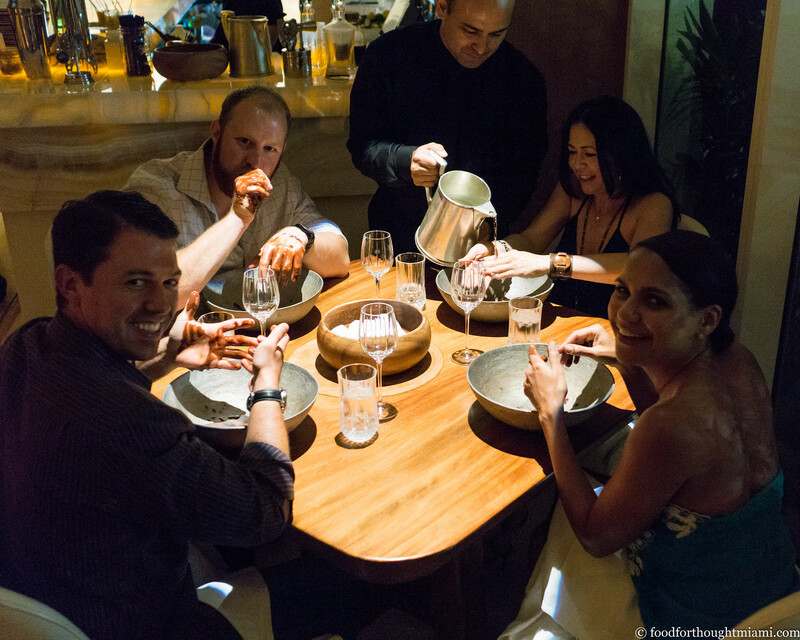 The meal starts with what Chef "JuanMa" calls "chocotherapy": liquid chocolate that is poured over the diners' hands, meant to be rubbed into one's skin and then licked off. It's messy, it's goofy, but it also gets everybody laughing and it smells great too. That's followed by another cocktail, a "mistela" of aguardiente and passion fruit (which would probably have been better if served colder) and a snack he called "Follow the Stars" made up of a crisp sheet of nori topped with toasted sesame seeds, citrus curd and candied slivers of carambola (a/k/a star fruit). 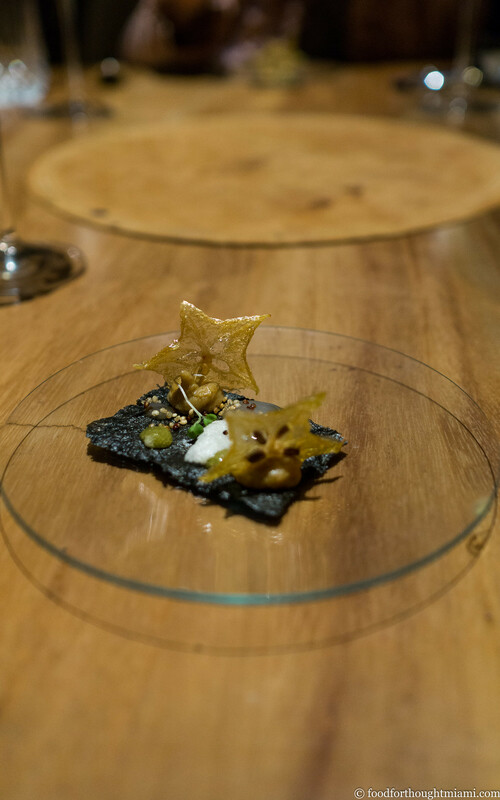 This uncannily reminded me of a snack I'd had five years ago at El Bulli, a nori cracker filled with tart lemon and sesame. We push chefs to go entirely off-menu when we do Cobaya dinners, but we understand that sometimes it's difficult to forego a signature dish. 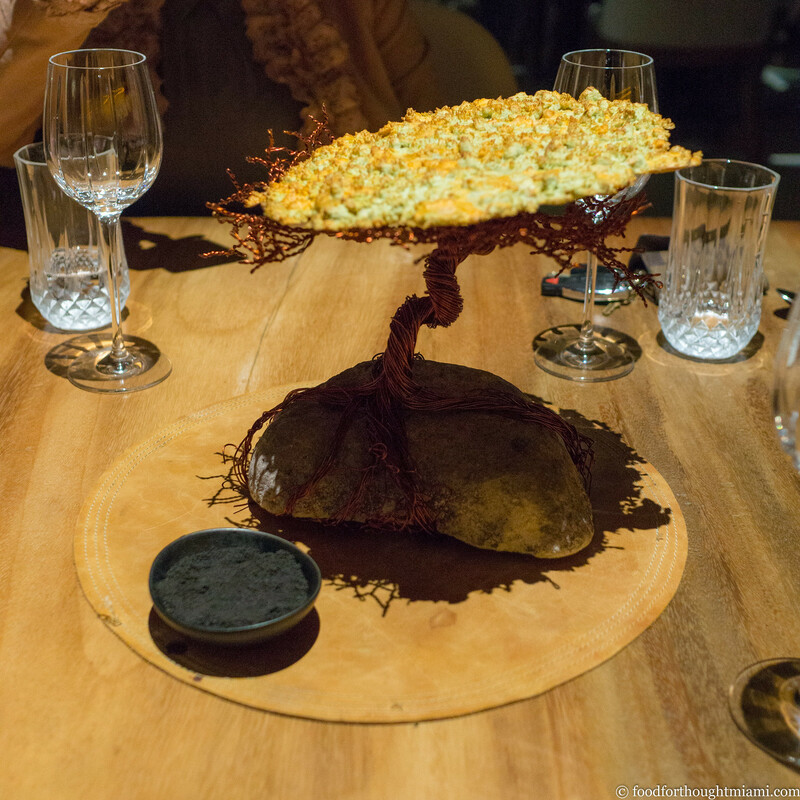 The "Amazon's Tree of Life" served at El Cielo falls into that category. As I said when I called it the "best thing I ate last week" a couple weeks ago: Visually it's a stunner: an undulating copper frame mounted to a stone, supporting a flatbread whose surface is pocked with bubbles, almost perfectly duplicating the appearance of a baobab tree. And it's delicious too, the chewy, crusty, cheesy bread meant to be torn and dipped into a a bowl with a creamy coconut sauce dusted on top with a black squid ink powder. This roasted corn soup is another course that was part of the tasting menu I'd sampled at El Cielo a few months ago; but I didn't mind repeating, as it was again one of my favorites of the night. 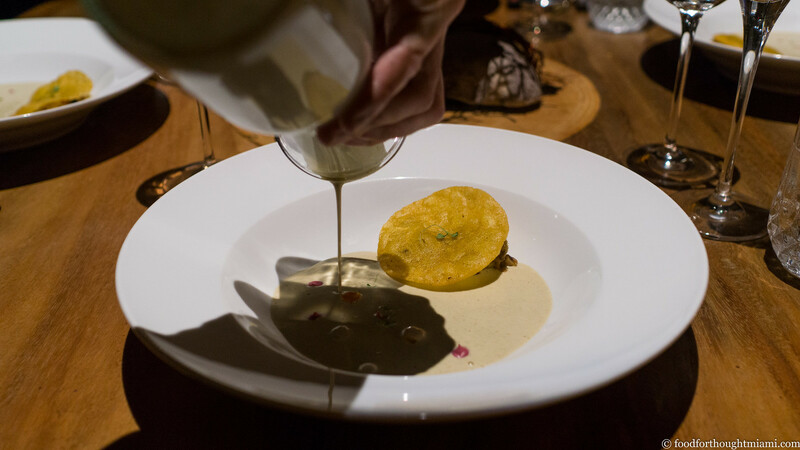 There's a pure, intense flavor to the creamy bisque, echoed in the thin crispy arepa which conceals a mound of caramelized corn kernels beneath it. Thomas Keller supposedly never repeats an ingredient in the multi-course tasting menus at The French Laundry. 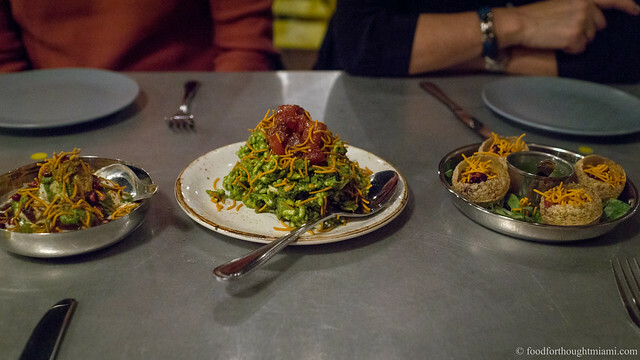 Barrientos tends to weave certain ingredients into his dishes repeatedly in different forms, in a fugue-like fashion. 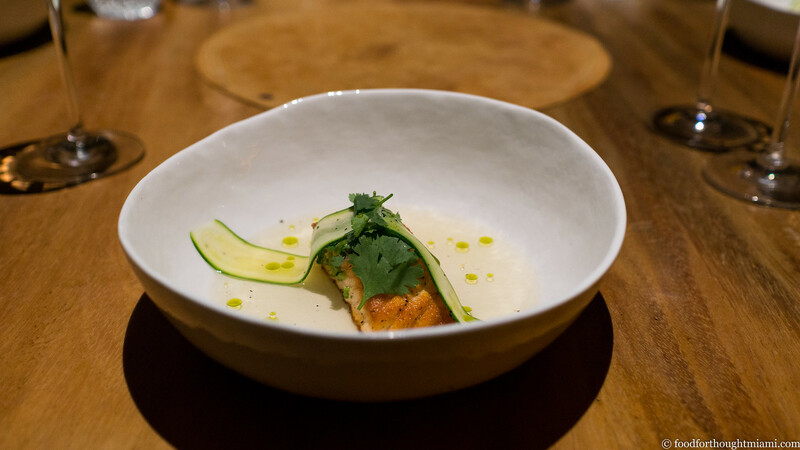 Here, corn is back as a delicate broth for a tranche of grilled salmon, speckled with dots of cilantro oil, topped with a translucent ribbon of zucchini. The sauce was excellent; the fish was dry and overcooked to my taste (and I can't help but wonder why, when surrounded by Florida's waters, you'd choose salmon instead of something local). This modernized version of chicken and beer (beer seems to be a common marinade ingredient for chicken in Colombian recipes) was another great sauce – as brightly herbaceous as its green color would suggest – and another protein I found dry. That didn't keep me from enjoying it with that sauce, or with the batons of tempura-fried green onions criss-crossed on top. "The Smoking Cow" is another dish that Barrientos features on his restaurant tasting menu, but again I get why he'd want to use it for this crowd too. 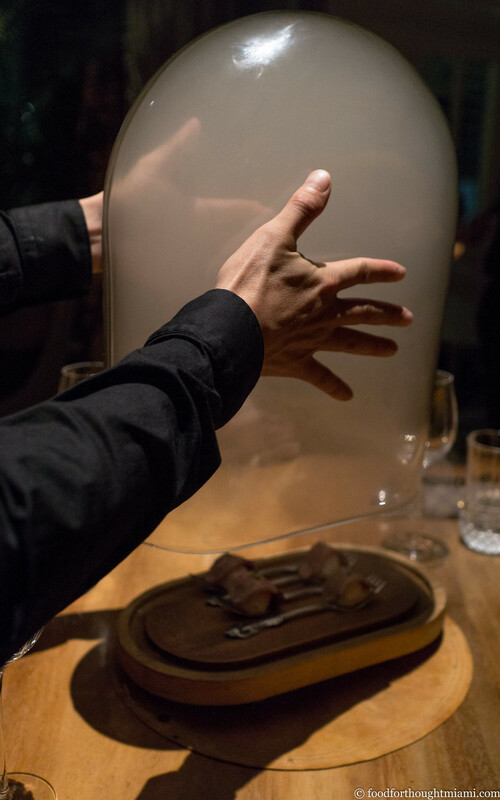 The presentation is grandiose: a tall glass dome filled with a cloud of smoke is brought to the table. 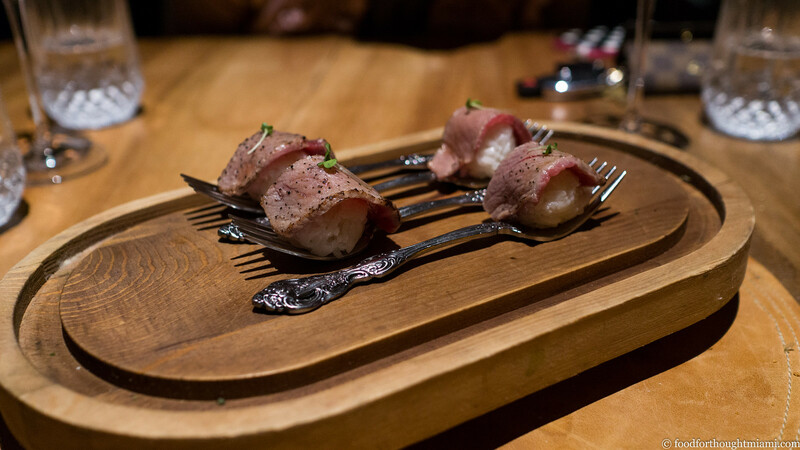 As the dome is lifted the smoke (and its aroma) dissipate to reveal nigiri-like ribbons of seared, smoked beef resting over mounds of rich coconut rice. It's a good show, and a good bite. 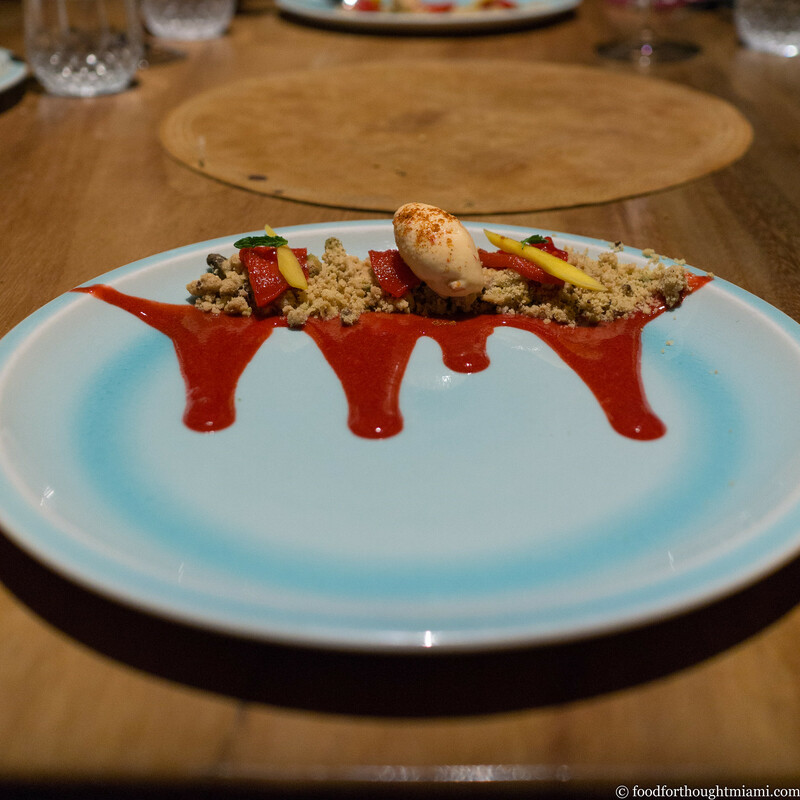 Barrientos' first dessert divided our table: most didn't like the chile-infused ice cream, but I did, in combination with the pistachio crumble, and ribbons of guava flesh and sauce that accompanied it. 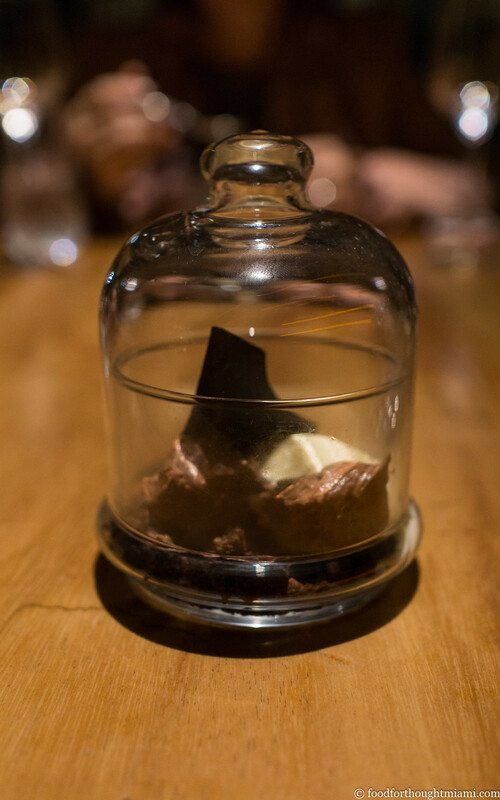 A more customary dessert followed, a few different types of chocolate in a few different textures. Our meal then concluded with one final parlor trick. 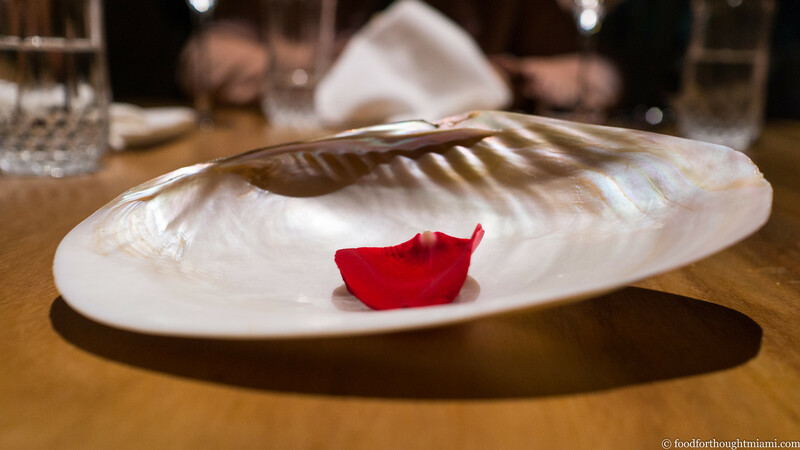 Rose petals are nestled into an iridescent shell: not to eat, but to rub on your hands, as their undersides are coated with a fragrant lotion. There were some great presentations and some great flavors here, and I'm gratified to see this kind of attention being directed to an "unheralded" Latin American cuisine. Chef Barrientos is young, eager, and ambitious, and I'm glad to have a little El Cielo in Miami. Thank you to Chef JuanMa and all of his crew at El Cielo, and as always most of all, to the guinea pigs whose interest and support makes these kinds of events possible.